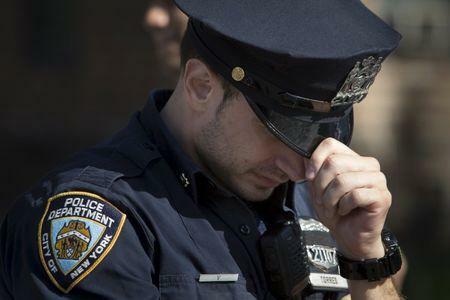 NEW YORK (Reuters) - The man suspected of killing of a New York City police officer on Tuesday had been the subject of a weeks-long manhunt by detectives in connection with a gang-related shooting last month, officials said on Wednesday. Police said Tyrone Howard, 30, shot Officer Randolph Holder in the head around 8:30 p.m. in the city's East Harlem neighborhood on a pedestrian walkway above the Franklin D. Roosevelt East River Drive, which runs along Manhattan's east side. At a press conference on Wednesday, Mayor Bill de Blasio and Police Commissioner William Bratton questioned whether Howard should have been permitted to enter a drug diversion program after a felony arrest last October for selling crack cocaine, instead of being sent to prison. "The perpetrator involved here was obviously a hardened, violent criminal and should not have been on the streets," de Blasio said. Justice Edward McLaughlin, who transferred Howard's case to drug court, said he was "certain" he had made the right call given the information at the time. "If there’s a way to recapture a guy’s life, isn’t that an appropriate thing to try?" McLaughlin said in an interview. "It's not like I flipped a coin. I didn't have a crystal ball, and I did not know what would happen a year later." A native of Guyana, Holder, 33, was a third-generation police officer whose father and grandfather served in that country. 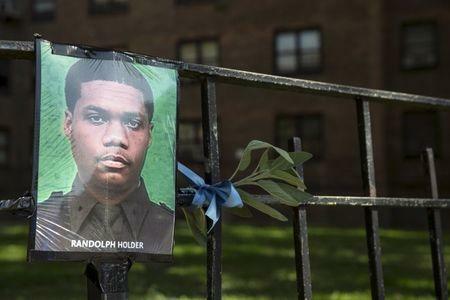 Holder became the fourth NYPD officer killed in the line of duty in the last 11 months. Based on information on Officer Down Memorial Page, a website that tracks line-of-duty deaths of police officers, that appears to be the most in any 12-month period since four officers were shot and killed between October 1996 and May 1997. In December, NYPD officers Rafael Ramos and Wenjian Liu were shot and killed in their patrol car by a man who said he was avenging the killing of unarmed black men by police. Holder and other officers had responded to reports on Tuesday night that several people were shooting at one another. He and his partner encountered Howard on the overpass, and Howard fired a single shot, striking Holder in the head, police said. Holder's partner, Omar Wallace, returned fire, and Howard was arrested a few blocks away with a gunshot wound to his leg, police said. Howard is also a suspect in the Sept. 1 shooting of a gang member in East Harlem. Police said detectives had made numerous attempts to arrest him but had failed to locate him. He was one of 19 people arrested in a major drug operation last October. At the time, authorities said most were affiliated with the East Army gang. Howard avoided jail in that case as part of a drug diversion program, which he did not complete. "He would have been the last person in New York City I would have wanted to see in the diversion program," Bratton said. Manhattan District Attorney Cyrus Vance, whose office handled that case, said in a statement the judge granted Howard's request for diversion over prosecutors' recommendation that he be sent to prison. Justice McLaughlin said in the interview that Howard had been in and out of prison for years on non-violent drug-related offenses and was an addict with a child. "I'm certain that I made the correct decision," he said. "I'm glad that in 33 years, this is the first tragedy that occurred in any way remotely connected with something that I did." Under the law, if Howard had any violent felony convictions his case would have been ineligible for drug court. Howard had been charged in connection with a 2009 shooting that left an 11-year-old and a 78-year-old wounded, police said, among nearly a dozen other nonviolent drug arrests. But McLaughlin said prosecutors had not pursued those charges in court. Therefore, he said it would not have factored into his decision. After McLaughlin's initial decision, another judge had to approve his drug treatment, McLaughlin said. That judge, Patricia Nunez, could not be reached on Wednesday for comment. Robert Levy, who represented Howard in last year's case, said officials who questioned the diversion were engaging in "Monday-morning quarterbacking." "All the diagnostic tools available in the system were used in his case," he said. "It's a tragic circumstance ... but to start blaming the court system is crazy." Records show Howard did two stints in prison for drug crimes and was most recently released in April 2014. The drug diversion program that Howard entered is intended to keep nonviolent drug offenders out of overcrowded prisons. Questions about Howard were raised on the same day Bratton was scheduled to join dozens of high-ranking police officials from across the country in Washington, D.C., to announce their support for efforts to reduce prison populations. 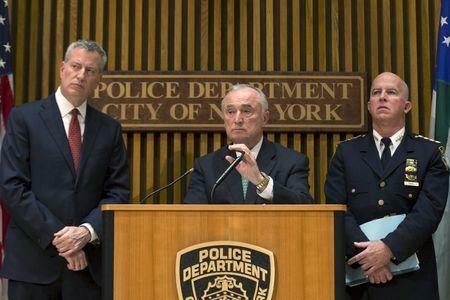 On Wednesday, Bratton said a "balance" was needed to ensure violent criminals like Howard remained incarcerated.